Here are four things I guess you need to know about my piece entitled Not A Happy Camper. Or not. 1) The title is misleading. Any notion of sadness or self-pity or uncomfortable overnight woodland sleepovers, things you might rationally expect from music entitled Not A Happy Camper, are totally missing from the music. I chose the title the first time I saved the computer file. That was way back, last December. I must have had my reasons for calling it that - although I no longer can remember them. It's possible I was in fact not a happy camper for some reason. I certainly have been N.A.H.C. on occasion since, like when I lost all the hearing in my left ear (which is mostly back now). Anyway - in December I wrote about three minutes of music and then I stopped. Recently I decided to finish the piece. No better title has suggested itself. Or maybe I didn't bother to think about it enough. And besides, there is a sort of tradition here at Mixed Meters of sticking with the original title/filename no matter what happens (although usually that trick only applies to much shorter pieces). 2) After about two minutes the music is high-jacked by a famous 19th-Century French Spanish orchestral warhorse. Everything starts off innocently enough, a cheap minimalist run-on sixteenth note feel - the kind of thing computers do really well but human performers can't keep up with. Then all of a sudden, more or less, it veers into far left field with quote after quote from that famous piece, a wildly inappropriate sequitur to what I'd already written. Some of you might recognize the high-jack music as a staple of symphonic pops concerts of your youth. For the rest of you, not knowing what it is won't really matter much. I will say that this: although most of 19th-century musical repertoire bores me to tears these days this particular piece still holds an ember of my interest. There's a certain mysterious aura thanks to metrical ambiguity and surprising interruptions of the melodic flow. 3) A wah-wah tuba often sounds like a bassoon. I've used the same effect in other recent pieces, such as this one or this other one. Basically, the sound of a tuba, as generated inside my computer (by a program called a sampler) is funneled through a band pass filter, which modifies the timbre of the sound. Technical terms. The filter is controlled directly from the music notation using MIDI commands. Electric guitars are famous for having wah-wah sounds, often controlled by a foot pedal. Unlike an electric guitar you couldn't have an effective real-life wah-wah tuba because there's no way to suppress the actual acoustic sound of the instrument. With a computer such bizarre things become possible. You can decide for yourself if they're desirable. 4). Not A Happy Camper is not my wackiest piece ever. In my opinion that honor still belongs with this particular craziness. Other nominees up for the award are here or there. "There" has an even whackier sequel. Click here to hear Not A Happy Camper, © 2013 by David Ocker - 413 seconds. Long ago, SO long ago that I don't remember when or where it happened, someone told me that the most important thing about getting my music or performances reviewed was not whether the comments were good or bad, but whether my name was spelled correctly. For twenty years I was a freelance clarinetist around Los Angeles, mostly playing chamber music and creative music gigs (meaning my own recitals and improvisations.) Contractors in Los Angeles all seemed to agree that I was not the sort of player they wanted in their orchestras or studio sessions. Their logic was sound. I was more interested in the creative aspects of my instrument than in the re-creative. The reviews I did get were usually positive and my name was always spelled properly. The highpoint of my career as a clarinetist, as many readers of Mixed Meters will know, was playing Frank Zappa's Mo 'n Herb's Vacation with the London Symphony Orchestra. Early in the 1990s it dawned on me that I wasn't getting much pleasure from the keyed beast any longer and it certainly wasn't contributing to my income. I decided to give up playing the clarinet. I've never regretted the decision. In spite of nearly two decades of being a "former" clarinetist, it's not uncommon for me to meet people who think I still play. It's happened twice this month already. Last fall a well-known musician of my acquaintance reminded me of a concert he had conducted in the early 80s for which I was NOT hired to play the bass clarinet although I apparently had been requested. He told me that the performance back then would have been better had I been performing. I scratched my head wondering why anyone would remember a detail like that after half a lifetime. Anyway, this post is really about Mo 'n Herb's Vacation. It's not Frank's greatest piece of music by far. It isn't really a clarinet concerto and has never been advertised as one. It simply has several sections of blindingly difficult music for the first clarinetist. And there is also blindingly difficult music for the other three clarinetists - just not quite so much. Frank was never terribly happy with the LSO recordings and he spent lots of time trying to fix them. I doubt he improved them much. Here's a recording which someone posted to YouTube, not of a performance but of a test recording done in Frank's studio before the London concert and recordings. All four clarinets are me. The bassoons are performed by John Steinmetz and Chad Wackerman is the drummer. It was my impression that I was the only clarinetist who had ever performed this music. But yesterday I learned that there had been another performance in 2005 in Venice Italy. I'm anxious to hear that recording. As I perused the web for information about this other Mo 'n Herb, I came across a 2007 discussion of the piece on Sherman Friedland's Clarinet Corner blog. I had never heard of Sherman Friedland. Apparently he was a clarinetist and pedagogue and professor at Concordia College in Canada, now retired to a life of blogging. Sherman starts by saying some negative things about Frank and his music. But at the end of the post he gets around to me. Wow! Of the work for solo clarinet and orchestra, called “MOE [sic] n Herbs Vacation” and played by David Ocker, solo clarinet, I can only say that is is the worst sounding clarinet playing I have ever witnessed, not being able to say “heard”. So, to the young person who wrote and asked me what I think, I can only reply “very sadly”. I wonder what an English teacher would think of Sherman's syntax. How does one "witness" a piece of music without hearing it? Fuzzy grammar or not, it's clear what he thinks. This guy has a lifetime of clarinet experience. For him to say that my playing is "the worst sounding clarinet playing" he ever heard is certainly intended as a major put down. Since I played Frank's music accurately, we can assume that Sherman's complaints are about something else, my tone or my style or my enthusiasm or about some other subjective issue of how he thinks the clarinet is supposed to sound. On that level I can take some pride in Sherm's defamation. At a certain point in my clarinet studies I made the conscious decision that I would not imitate conventional clarinet playing, meaning the standard, omnipresent, wimpy, unadventurous, never-use-vibrato playing style produced by so many classical clarinetists. Colleges and clarinet teachers, such as Sherman, must still be turning those clones out in exceedingly large numbers. All of them hoping, no doubt, to score an orchestra job. Any of them interchangeable with the others. None of them the slightest bit distinguishable by their sound. I listened to samples of Sherman's own playing on the web. He seems to fit the mold himself. I also found a short New York Times review of his recital at Carnegie Recital Hall in 1986. Mr. Friedland is a competent player and seemed sincerely in love with his material. Still, one could have wished for a sharper technical edge in the Bernstein and the fulsome tone that might have invested Berg and Reger with more vivid colors. Sherman would have gotten more notoriety from his performance if the reviewer had said "this is the worst clarinet playing I've ever heard". People remember when something is described as the "worst ever". "Competent"? Could that be another word for tepid? When I played I tried to make the clarinet something more than mono-timbral, to play with a variety of tone colors and styles and attitudes, the very thing, the fulsome tone, which the New York Times found lacking in Sherman's recital. I wasn't always successful in my goal of aural variety but always I gave it my best shot. Sherman, apparently, doesn't think along those lines and disparages those who do. Sherman's comment makes me wonder if he often blogs his mouth off without thinking, like some sort of online jerk. Maybe. Maybe not. More likely he's just someone with an exceptionally well-defined unchangeable set of musical assumptions which he has trouble stretching to account for the myriad varieties of other music in this world. All in all, I would rather not have had my playing, even a 30-year old performance, called "the worst sounding clarinet playing I have ever witnessed" by anyone. But, considering the ivory tower source of the remark, I'm happy to wear this comment proudly. Plus, I do thank him for spelling my name right. Ocker, as both a performer and composer, brings to music the kind of personal quality that most professional musicians have had trained out of them. A number of my historical clarinet performances are available for listening here. Here's a photo taken in Zappa's studio the same day the overdub recordings were made - plus discussion about whether it's a real photo or not. (It is.) I'm the one with both beard and clarinet, on the right. In the Clarinet Corner blog posting, the "young person who wrote and asked me what I think" named Martin, is this person. 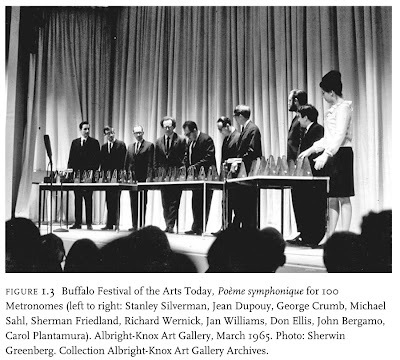 If you click the Xtet flyer picture, it should enlarge enough for you to read the press quotes which the ensemble received. Xpect Xpuns. Yeah, I'm living in the past. I can think of worse places to be. ADDENDUM: I thank everyone for their comments. More discussion of this topic happened on Facebook. I was fascinated recently by a radio interview with author Charles C. Mann who talked about his book 1493. It covers the social and ecological effects of the arrival of Europeans in the Western Hemisphere. Before reading 1493 I decided it would be best to finally read Mann's earlier work 1491. 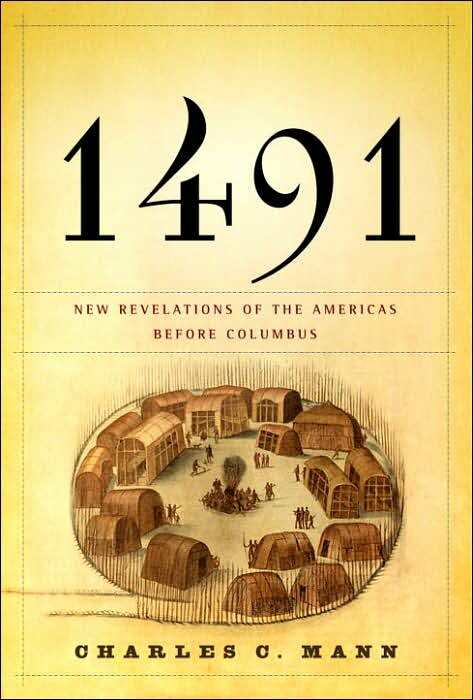 1491 is subtitled New Revelations of the Americas Before Columbus. It turns out that the stories we were most likely taught in grade school describing how American Indians lived before Columbus "discovered" them weren't terribly accurate. 1491, published in 2005, covers a plethora of recent discoveries and theories. Primary sources of information dating from before the first Europeans are scarce. Some cultures had developed complex writing, like the Mayan hieroglyphs. But most Mayan manuscripts were destroyed by the Spanish who no doubt congratulated themselves for the enlightenment of their actions. Other pre-1492 records have survived but cannot be fully understood by modern scholars, like the Incan knotted strings called Quipu. Then there were the very first Europeans who wrote about what they saw in the New World. This is another source of information about conditions just before the Europeans came. Some of these stories differed greatly from what was seen by visitors several generations later and the early descriptions came to be regarded as inaccurate or even fanciful. At the very beginning of 1491 Mann stresses that we not make the error of assuming, because conditions are a certain way now, that they must have been just so for ever. For example: how many people inhabited America before Columbus arrived? Some explorers discovered vast uninhabited areas and they concluded that no one had ever lived there. In fact the native population had changed radically because the immune Europeans unwittingly brought deadly smallpox with them. Pre-Columbians left behind lots of archeological clues to their existence. Ruins of ancient citys, often including temples and pyramids, tools, pottery and trash. Massive earthworks in remote Bolivia that are only visible from the air. The ability of archeologists to decode these clues have improved over the years and the theories about what they mean have changed as well. What percentage of the indigenous population were killed by smallpox? When did the earliest humans arrive from Asia and did they use stone tools? How many people lived in the Amazon basin? The histories of these and other subjects, as detailed by Mann, all involve the overthrow of orthodox scholarly theories in favor of newer ones based on more recent evidence. The newer ones will, I betcha, eventually become orthodoxy themselves only to give way to improved interpretations as future generations of Indiana Joneses study the issues. Using a different method, [botanists] concluded that Indians might have bred the modern peach palm by hybridizing palms from several areas, including the Peruvian Amazon. Whatever the origin, people domesticated the species thousands of years ago and then spread it rapidly, first through Amazonia and then up into the Caribbean and Central America. Bactris gasipaes was in Costa Rica 1,700 to 2,300 years ago and probably earlier. By the time of Columbus, one seventeenth-century observer wrote, Native Americans valued it so highly "that only their wives and children were held in higher regard." While there are occasional dull passages in 1491 by Charles C. Mann, for the most part it is compellingly written. Although nominally it deals with an historical period which ended over 500 years ago, much of this information seems still relevant. Issues about our relationship with the descendants of the indigenous Americans and also preserving the native environment, which may not be what we think it is, are clearly affected by this information. And it would be wonderful if some of these stories filtered down into grade school American History curricula - which I suspect hasn't kept up with modern discoveries since I was a grade school student some fifty years ago. Another Mixed Meters review of a book with a single 15th century year as its title. 1453 has nothing to do with 1491. I took the picture of the Mayan ruins in 2004. It is the Observatory at Chichen Itza. Here is the picture I took of the more familiar pyramid nearby. Here are many pictures of earthworks and other ancient sites, mostly taken from the air.